I love this quote because it reinforces that teaching is not simply the transmission of knowledge from instructor to student. The teacher is a guide, an orchestrator, a setter of conditions who organizes experiences which lead to student learning. I have had the great opportunity to learn with teachers who used this approach; creating conditions of bewilderment, inquiry and debate and then bringing a discussion full circle leading to one of those brilliant “a-ha” moments when internal change of thinking occurs. I don’t believe an internal change of thinking can come from knowledge transfer alone, it must come from inspired and meaningful connections between an idea and the individual. As Palmer so eloquently puts it, the teacher must intentionally create those conditions in order to orchestrate learning experiences. The text moves on to focus on “who is the self that teaches”; an inward look at what drives teachers to be, act, and love what they do. In my own experience I have never encountered a group of professionals so passionate about what they do. I have seldom met a teacher who did not wholly love and believe in what they do. Of course there are issues with the bureaucracy, organization and establishment of teaching institutions, but at the heart of it (and even after some gripes) teacher’s usually confess that they love their craft. And how important is it to love what you do? In my opinion, absolutely essential; something to strive passionately and vigorously for. “A vocation that is not mine, no matter how externally valued, does violence to the self.” (Palmer, 1998; pg. 31) It may be unrealistic to assume we can all love what we do, but I thoroughly enjoyed Palmers section on the importance of at least striving for this. The point here is that I believe most teachers have already achieved this basic life principle, in finding and doing something they are truly passionate about. This makes them perfect candidates to inspire the same direction in their students. Palmer address the issue of fear in teaching, commenting that in fact fear can be a healthy emotion. For if a teacher has fear that they are teaching poorly, this is unlikely a sign of failure but rather a sign that they care about their craft (Palmer, 1998; pg. 39). I have heard this idea before but it was great to be reinforced in Palmers’ text. Our natural instinct is to imagine that fear means something is wrong, while it may be there to alert us to corrective action. “Don’t send us any more sick people – we don’t know what to do with them. Send us healthy patients so we can look like good doctors.” (Palmer, 1998; pg. 42) This is a great analogy of the hospital to the school. I have heard teachers blame students for the failure of learning, and perhaps to some degree this may be true, but Palmer warns against this as our assumptions that students are inattentive, lazy or unfocused lead to similar pedagogy. Furthering the hospital analogy, “we rarely consider that our students die in the classroom because we use methods that assume they are dead” (Palmer, 1998; pg. 42). If we need proof that students’ classroom coma is a result of the classroom conditions set by teachers, just observe them in the library working together, in the halls, participating in extracurricular or sporting events. We need to find ways to harness that energy and bring it into our classrooms for vibrant experiences. Palmer reminds us that one of the greatest blessings of teaching is that it allows us continual encounters with the young. Good teaching is described as providing hospitality to the young, and hospitality often provides as much benefit to the provider as the receiver. In interacting with the young we have the opportunity to co-create the world, re-weave the social fabrics on which we depend and shape the future. Palmer warns against being fearful or our students, or trying to be overly popular, rather accept that fact that you will go on a journey of learning together each semester being aware that the teacher has as much to learn and discover from their students as they do from us. 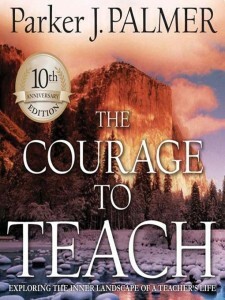 The Courage to Teach was a joy to read and I would recommend it to new as well as vastly experienced teachers at all levels. Even if you already truly love what you do and some of the recommendations seem trivial, I believe that Palmer has created a wonderful text to incite reflection and reformation of our attitudes as educators. Multiple copies of the book are available in the Centre for Innovation and Excellence in Learning for the VIU community to borrow. Palmer, P. (1998). The Courage to Teach. Exploring the inner landscape of a teacher’s life, San Francisco: Jossey-Bass. Book Review: The Courage to Teach by Michael Paskevicius is licensed under a Creative Commons Attribution 4.0 International License.